Would you like to turn off the lightbox for Envira Gallery images? Envira Gallery gives you the freedom to turn off your lightbox for your desktop and mobile devices. This tutorial will walk you through how to disable the lightbox for Envira galleries. Can I set up my galleries to point to pages instead of using the lightbox? Do I have the same options for Envira albums? In your next step, just navigate to the Lightbox tab. Here you’ll be able to uncheck the box next to the Enable Lightbox? to turn off the lightbox for this gallery. Click Update to your gallery and that’s it, you’ve successfully disabled Lightbox for your gallery for desktop viewing! You’ll also have options on the Mobile tab to turn off the lightbox on mobile devices as well. 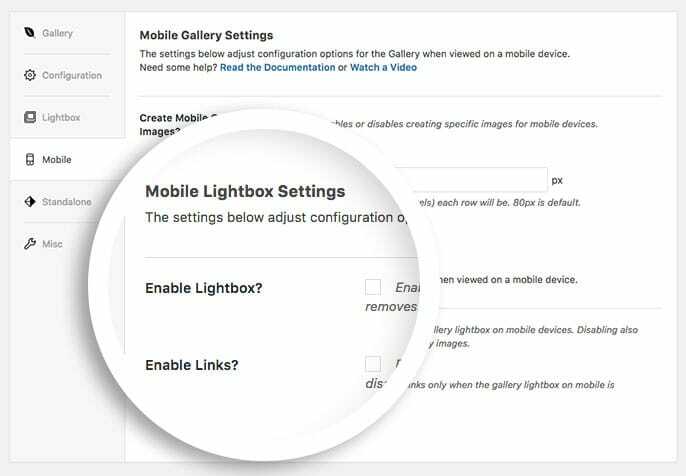 To do this, navigate to the Mobile tab and uncheck the option to Enable Lightbox? for mobile devices. Click Update to your gallery and that’s it, you’ve successfully disabled the lightbox for mobile devices. Would you like to learn how to add a link to your lightbox image? Check out our tutorial on How to Add a Link into the Lightbox. A: Absolutely! Check out our documentation on Using External Links in Envira Gallery. A: Absolutely! On Envira Albums, you’ll have the same options that you do for galleries. Just follow the same steps above to turn off the lightbox for Envira Albums!